The CDAC Winter Workshop took place on February 27-28 at the Advanced Photon Source, Argonne National Laboratory. Forty-two graduate students and postdoctoral associates (including 28 graduate students from CDAC academic partner groups) attended a series of six tutorials given by CDAC academic partners and three lectures by scientists from NNSA laboratories. Lecturers included Dana Dlott (Illinois), Bob Downs (Arizona), Tom Duffy (Princeton), Rudy Wenk (UC Berkeley), Surrendra Saxena (Florida International) and Yogesh Vohra (Alabama-Birmingham). 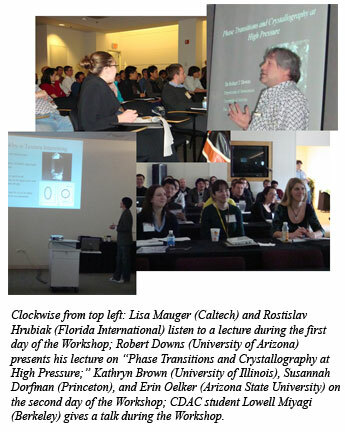 The lectures covered a broad range of fundamental and applied topics relevant to high P-T materials research. 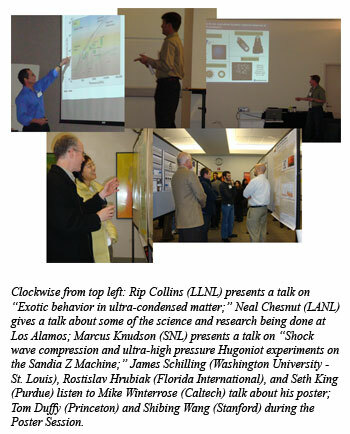 NNSA Lab scientists giving presentations included Rip Collins (Livermore), Neal Chesnut (Los Alamos) and Marcus Knudson (Sandia). The presentations by NNSA scientists focused on current research activities taking place in their respective groups. The workshop also featured short presentations provided by CDAC graduate students on their dissertation research. These talks were given by CDAC graduate students Kathryn Brown (Illinois), Chris Seagle (Chicago), Erin Oelker (Arizona State), Matt Armentrout (UCLA), Sara Whitaker (Ohio State), Andrew Stemshorn (Alabama-Birmingham), Lowell Miyagi (UC Berkeley), Susannah Dorfman (Princeton) and Mike Winterrose (Caltech). The workshop included a poster session on the evening of February 27, which included 32 posters prepared by students and postdoctoral associates at the workshop. Following the poster session, attendees enjoyed a banquet dinner that was highlighted by the musical stylings of Gene Ice from Oak Ridge National Laboratory. The full workshop program can be found here.